Hello everyone…Thanks for stopping by this week. Some of the big movies have begun to roll out in the Summer Film series. In case you missed it, here’s the link to the Summer Film News from last week. Melissa McCarthy’s film, Life of the Party, is out and so is Book Club. Book Club has gotten some surprisingly good reviews, albeit from a plot that is a weak one. But the actors are all A-listers, and it has good reviews in 6 Degrees Magazine from Ebert.com. Life of the Party has some mixed reviews, but for the most part, it is recommended as a good light comedy. The Seagull, from Chekhov and starring Annette Bening, is reviewed on Ebert, as well as Solo: A Star Wars story. There are mixed reviews for the Solo/Star Wars film, and as some people have asked me why we would put both positive and negative reviews of a film in the same magazine, I would say that after reviewing films for many years, there are people who have strong opinions on films they absolutely love or they loathe. Case in point: for me it is a lukewarm loathing for Citizen Kane and Gone with the Wind. I never have had a soft spot for either of these films, but they are acknowledged classics. Tastes in film are relative, but the artistic quality and merits of production techniques are not. Citizen Kane used some cutting edge camera work for the day, and Gone with the Wind was the first true Blockbuster in terms of marketing and promotion of a film. So they are acknowledged as bonafide classics, but you can certainly find reviews that pan both of these films out there somewhere! And finally, one interesting piece from Uproxx is entitled: The Franchise Era of Filmmaking: What is it, and how did we get here? This is a subject I often pontificate upon. Why are so many films remakes, or part of a series franchise? The article cites a list of box office high-grossing films, and last year there were none in the top 10, and only one-Coco from Pixar-which was on the list. The list that I occasionally print in Friday Flix shows only two of the all-time box office top 10 and three of the top 20 that are NOT part of a sequel or franchise and are original films and not remakes of earlier hit movies. “The business has shifted to brands, and franchises”….is one way of explaining it. The explanation of the superhero genre, the big bucks involved, the profit margin that explains the continued success of this model, and the overall Hollywood machine is laid out in “The Big Picture: The Fight for the Future of Movies” by Ben Fritz. This article is highly recommended as a great long read. The Tampa Theatre, my hometown art theatre which has recently been renovated and has reopened, is beginning their Summer Film series. Most of the films look pretty pedestrian, but there are a few on the ‘lists’ that we have been discussing-specifically, the list of films to see in a movie theater once in your life. These summer series films are the original Bladerunner, Casablanca, & The Wizard of Oz, The other films, (not on Tampa Theatre’s list) I would recommend are Jaws, (MOST of Hitchcock’s films from the 50’s and 60’s),The Godfather, 2001: A Space Odyssey and Lawrence of Arabia. If any of these films are showing at an art house near you, run, don’t walk, to take them in and experience them in the theater. We talked in Summer Film News about some of the recommended films to record in your own “Armchair Film Fest.” I would recommend The Great Escape on TCM this week, as well as You Can’t Take it with you, Magnum Force and Vanishing Point. Steve McQueen stars in one of his first major screen roles in this prisoner of war film from 1963, The Great Escape. The cast includes Richard Attenborough, Charles Bronson, James Garner, James Coburn and Donald Pleasance. The other films are Magnum Force, with Clint Eastwood in a classic tough guy role that may seem dated in the #MeToo era, yet this is who we are as Americans and the fact that Eastwood was loved and adored for the type of macho mantra of shoot first and ask questions later is one of his roles that cannot be ignored. Love him or hate him Clint is who we are. Vanishing Point belongs in the category of one of those really interesting films that got away. Barry Newman was a TV star, with a modest following, when he made this film in the early 70’s that has some degrees of connection to Thelma and Louise and other films like, The Driver with James Caan. It’s about a man named Kowalski who makes a bet that he can deliver a Dodge Challenger from Denver to San Francisco in 15 hours, and finds himself in a race against time to beat the clock, law enforcement, and his own internal demons. It’s a kind of existential quest, with the man vs man, and man vs machine story line keeping the film’s doomed lead character, in tandem with the bare bones plot, moving forward to its inevitable conclusion. Cannes film festival has had some interesting debuts these past few weeks. There was one screening from director Lars von Trier called The House that Jack Built that prompted numerous walkouts over the gory content. Spike Lee has a film at Cannes called BlacKkKlansman which is the type of film and statement that Lee has been making since Do the Right Thing. The film is adapted from a memoir of an African-American policeman who infiltrated a chapter of the KKK in the 1970’s. Lee’s voice is one we need to hear loud and clear in these confusing times. This remake from director Antoine Fuqua, and starring Denzel Washington and Chris Pratt, sticks fairly close to the plot of the original from 1960. 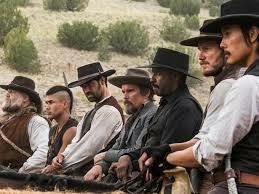 This is a steady and solid remake of the classic Western with a winning cast of characters. Jennifer Lawrence is on board as a young widow who is determined to rid her town of the villainous gang of outlaws running roughshod over the citizens. The old formula still holds: the town under siege, heroes riding in to save the day, upholding the values of the West while instilling revenge and righteous fury to right the wrongs they see. The audience seeks closure in the denouement, which is the ritual gunfight, or as it stands now, the gun battle. Finally the balance of the Universe is restored when right triumphs over overwhelming might. Denzel Washington is one good reason to watch this film. Ethan Hawke is equally up to the challenge playing a broken but not bowed anti-hero role. There’s not much more to add as there is new ground broken here in movie history, but the storytelling elements of the film hold it together. Unlike the unfortunate Ben Hur remake, there is a cohesive plot to follow…thus making this film imminently more watchable. And for moviegoers hankering for the return of a good old-fashioned Western, this film delivers. Chris Pratt may be slightly miscast with some of his comic asides delivering touches of awkward comic relief. When the character is a natural fit for a Western, as was the case for an actor like Steve McQueen, who starred in the original, it’s always hard to compare the performances. But as a whole this film, set firmly in the category long neglected in Hollywood of a pure Western movie, fits the bill nicely.